Here’s my latest The Other Side column for ConservativeHome, published here on Tuesday. This week I look at protest voting, loss aversion and why that matters to this year’s referendum on Scottish independence and any future EU in/out referendum. My thanks as ever to the site’s editors, Paul Goodman and Mark Wallace, for giving a Lib Dem space to provoke – constructively, I hope. For years the Lib Dems were dismissed as merely the repository of ‘none of the above’ voters. It was something of an unfair jibe – the party has long attracted voters with a core set of coherent liberal values – but not wholly unfounded. And that USP, of being the only one of the three main parties not to have dirtied our hands in government, was obliterated the moment we formed the Coalition. In the past, the Conservatives were the most effective protest vote against Labour; and Labour the most effective protest vote against the Conservatives. Neither liked it much when first the Lib Dems, and latterly Ukip, came along to disrupt this established pattern. So the Big Two decided to label any voter who didn’t like either the Conservatives or Labour, and who voted accordingly, a protest voter. The truth is that the public more often votes against something they don’t like rather than in favour of something they do like. Economists have a term for this behaviour, ‘loss aversion’: people’s tendency to strongly prefer avoiding losses to acquiring gains. We see loss aversion’s political equivalent beyond the crucible of party politics. Let’s look at the referendums held this parliament. Most notably, there was the decisive rejection of changing from first-past-the-post in 2011, with just 10 UK areas out of 440 voting in favour of the Alternative Vote. A year later, 11 cities in England voted on whether or not they wanted their local authorities to be run by an elected mayor – 10 chose to maintain their status quo. Only once did the hopey-changey thing work out, when, in March 2011, Wales voted to extend the law-making powers of its national assembly — but this simply added to existing Welsh assembly powers and was in any case supported by all four of its established parties. 1. The public normally votes for the status quo when asked its view in a referendum – opting for the safety of avoiding loss, rejecting the risk of possible gain. 2. The exceptions to this rule are when the change proposed in a referendum is backed by the Government of the day and other major parties – that safety-in-numbers appears to reassure voters they’re not really taking a risk. These rules-of-thumb will be put to the test later this year, when Scotland votes in September whether to become an independent country. However, the waters are muddied in this referendum. True, it’s a high-stakes decision for the voters, which would suggest they’d opt for the safety first of staying in the union. But the Scottish Government, albeit alone among the major parties, is pushing for a ‘Yes’ vote. To date, the ‘Better Together’ No campaign has hammered home a negative message. Scotland, it says, faces an uncertain future on its own. Former Labour cabinet minister Lord Robertson has gone further, much further, warning a vote for independence would be “cataclysmic in geo-political terms”. The Scottish Lib Dem leader Willie Rennie has urged a more positive vision of Scotland staying in the UK: a “sunshine strategy”, he calls it. I like the idea, but I doubt it will be as effective. Just ask the ‘Yes to AV’ campaign team – the moment that ‘No’ poster appeared (“She needs a maternity unit, not an Alternative Voting system”) they knew the game was up. That’s how you up the Anti: vote no, or the baby gets it. If we’re going to trade clichés, then ‘Better Together’ needs to focus less on ‘sunshine strategy’ and more, much more, on ‘bread and butter’ issues that matter to voters’ everyday lives. There is, of course, another referendum potentially in the offing: an in/out vote on the UK’s membership of the European Union. The voters last had their say in 1975: they opted then for the status quo of staying in (see rule number 1, above). And I find it very hard to imagine the electorate voting to say ‘No’ to the EU if the Conservatives, Labour and the Lib Dems are all campaigning for the UK to stay in (see also rule number 2, above). Ukippers will, of course, dispute this. Yet there is something of a Nigel Farage paradox happening in the polls – just as Ukip’s popularity has increased recently, so too has approval of the UK’s continuing membership of the EU. If David Cameron remains Prime Minister beyond the 2015 election – and assuming he is able to cut some kind of deal with his European partners that gives his re-negotiation strategy a fig-leaf of respectability – he will be the Prime Minister who safeguards the UK’s membership of the EU for the next generation. It may not be a boast he’d dare make to his own party, but it’s one for which the country may have cause to be grateful to him. 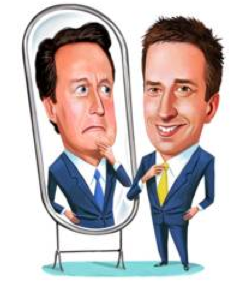 If David Cameron isn’t Prime Minister after 2015, then the next Conservative leader – almost certainly a Better Off Outer, or an opportunist, or both – will feel no compunction about joining forces with Ukip to campaign for a ‘No’ vote. In those circumstances, all bets are off about what the result would be. But, then, if Cameron isn’t Prime Minister there won’t be an EU referendum. It’s a rum choice facing those on the right who want the UK out of the EU. Vote Conservative and see Cameron campaign for a ‘Yes’ vote. Vote Ukip and help put Ed Miliband in power so there’s no vote at all. Riddle me this: how do you vote to protest against that?